Personal Collections and Block patterns, as introduced by my Ultimate Denim Dress. You may have noticed on IG, I’m deep in collection making territory. For years, I’d tried to put one together but plans always fell through, or the project didn’t work, or the fabrics… Finally, I think I’ve reached that sewing sweet spot. Projects work, lately. Garments fit, lately. Fabrics match. There is coherence. And when…… Continue reading Personal Collections and Block patterns, as introduced by my Ultimate Denim Dress. Did you catch my most recent project on the Minerva Crafts blog? I made this Named Patterns Gaia Quilted coat over the holidays. It was my first time using neoprene and experimenting with the “soft tailoring.” Be sure to check it out! Named Clothing Asaka Kimono in Wine Viscose Linen Noil for Sewn with Hart! Winter was looming when Hart’s Fabric asked me to join their February rendition of Sewn With Hart. At the time, I was caught up in the holiday haze. This collaboration, however, gave me the opportunity to look forward to February, to what I expected to be a less excited moment, and to ask myself, how would…… Continue reading Named Clothing Asaka Kimono in Wine Viscose Linen Noil for Sewn with Hart! I’m gearing up for a few upcoming blog posts when I realized–I never put up a link to my Named Clothing Solina Dress! I sewed this dress in a viscose twill, a fabric sponsored by Minerva Crafts. You can find my write up over at their blog. 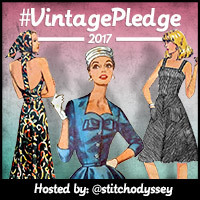 I joined the Vintage Pledge!